Isao Miyoshi runs a dental laborato ry in Sakado, Saitama Prefecture. Every day, he visits the dentistry department at the local Meikai University Hospital, where he collects dozens of plaster impressions of people’s gums and their remaining teeth. Back at Miyoshi’s lab, his 12 dental technicians then craft new dentures as replacements for the patients’ lost teeth. But these days, 63-year-old Miyoshi is also dealing with used dentures — which he’s in the business of recycling. It’s a project he started recently that’s making a difference to many people, including himself. One recent afternoon in his small office, Miyoshi showed me a big box full of mail packages addressed to “The Japan Denture Recycle Association,” an NPO he launched in December. Randomly, he picked out one parcel and cut it open with a pair of scissors. As he put down the letter and unwrapped the tissue, out fell three sets of partial dentures with one ivory-colored artificial tooth and pink plastic gum in each of them. On both ends of the dentures were metal clasps used to hook onto adjacent teeth to keep the dentures in place. “Hmm. These will probably amount to about 1,200 yen,” Miyoshi said as he cast an eye over the small sets on his palm. Then, he put them into a container filled with other partial dentures. 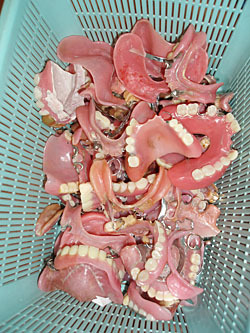 No matter how many teeth were on them, all the dentures had metal clasps — and these are what Miyoshi is recycling. 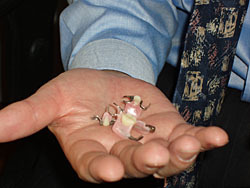 Clasps and other metals used to stabilize dentures are often alloys of gold, silver and palladium. 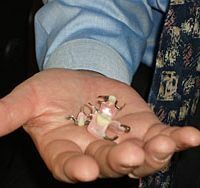 According to Miyoshi, 5 grams of these alloys are worth around 2,000 yen once they are separated from the dentures. Before that, the clasps are nothing but clasps. Some local governments classify dentures as burnable wastes, so some people end up throwing them away. “In our lab, we make about 30 new dentures a day. That means 30 more are thrown away,” Miyoshi said. It was a chat on this very topic with a Meikai University dentist last summer that prompted him to come up with the idea of recycling. He decided he would ask people to donate their disused dentures with metal on them, then take them to a refinery and donate the earnings from selling the pure metals to UNICEF. For some time, Miyoshi had wanted to do something to support needy children in other countries. “After I had this idea in August, I got so excited and kept thinking about recycling dentures all day and night. I even dreamed about it,” Miyoshi said as he continued opening more packages of dentures — usually along with letters of thanks and support for providing a good way to use them. With support from dentists, and the technicians at his lab, the NPO started operating in December, and Miyoshi believes it is the first one in Japan doing denture recycling. A press release the NPO sent off soon caught media attention, and the unique project has had extensive coverage in newspapers and on television in the Kanto region. 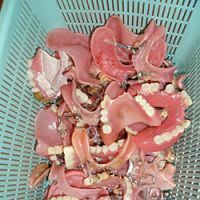 By now almost 1,000 people, mostly elderly, have sent their old dentures after disinfecting them in hot water, wrapping them in a piece of cloth and putting them in a plastic bag as the NPO requests. The items received also include bridges, which are fake teeth placed between natural ones and fixed to them, and crowns, which are fixed onto the remains of a tooth. Some of these are made of pure gold. Consequently, when the association made its first donation to the UNICEF office in Tokyo at the end of January, it was able to hand over 1,036,102 yen after only two months’ operation. Meanwhile, dentures continue to arrive — some even including jewelry — and Miyoshi said the second donation will be at the end of this month. In one parcel that Miyoshi opened as we spoke, the sender had enclosed a 1,000 yen note with some dentures, saying in a letter that he wanted to make the contribution in case his dentures weren’t worth very much. “Oh wow, this makes me feel like crying,” Miyoshi said as he put the dentures into the container. “You know, they say that Japanese society has lots of problems, but I really feel the warmth and kindness of elderly people through this. It makes me think that this society still isn’t so bad,” he said. As most of the contributors are the elderly, Miyoshi feels that the association should eventually utilize the donations for the sake of senior citizens. 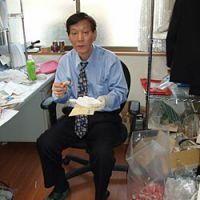 At this point, though, Miyoshi says the most important thing is to continue raising awareness that disused dentures can help make a difference — and get the idea of denture-recycling into more people’s thinking. Finally, after emptying all that day’s packages, Miyoshi opened the window and took out a cigarette. As he smoked, he reflected on how his life had changed since he started this project. “I’ve become so restricted in what I do. For example, I don’t feel comfortable drinking outside, or playing pachinko because I don’t want people to be suspicious that I might be using the money from recycling dentures,” he said. “It’s like I’ve become a saint . . . But maybe it’s good to be one for once in a lifetime,” he added with a wry smile.